A modern hotel from the Vienna International Hotels Group, Andels Krakow brings cutting-edge design and functionality to the city's natural Old World charm. Designed by architect duo Jestico + Whiles, Andels is sleek, with cool interiors and a business-like character. Located right next door to Krakow's Main Railway Station and Galeria Krakowska (the city's premier shopping centre), it is both accessible and offers plenty to do right on its doorstep. Just 5 minutes walk away you will find the Old Town, with its famous Market Square and stunning architecture, as well as the best selection of restaurants, clubs, cafes and bars to spend your leisure time. 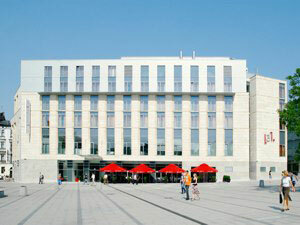 Andels Krakow also offers excellent business facilities. With a conference centre which can accommodate up to 320 people, it is a great place at the heart of New Europe to bring together business partners in a dynamic and impressive location. Naturally, the conference centre includes all the latest multimedia presentation equipment and state-of-the-art technology. With 159 rooms and apartments, a ground-floor restaurant offering Polish and international cuisine, and an open terrace during the summer that overlooks the square, Andels is a modern and forward-looking hotel that will appeal to the contemporary traveller.